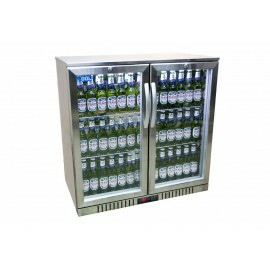 Fantastic double door bottle cooler ideal for any bar or pub or restaurant. 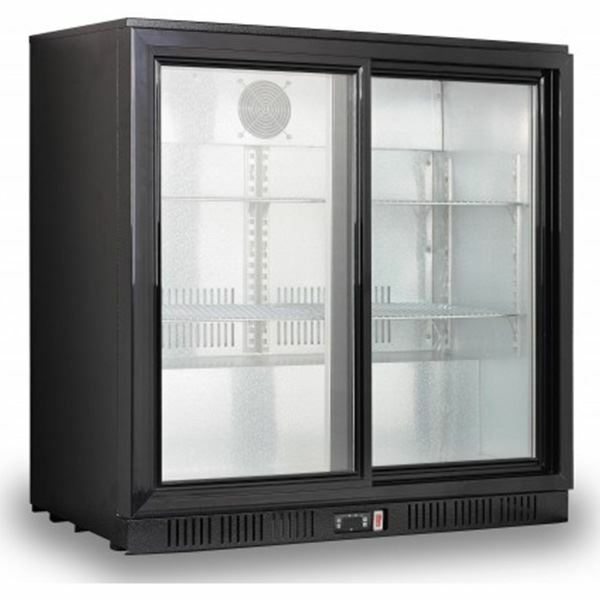 The cabinet features self-closing sliding doors, two shelf per door section and capacity 190 330ml bottles. Other great features include LED internal lighting, door lock and electronic controls ensuring reliable and fuss-free operation. Free Next Day Delivery included on selected products. ALL Standard Deliveries have a lead time of 1 to 5 working days depending on the product selected. Our customer services will advise on an exact delivery date. ALL Deliveries are Free to commercial addresses, Mainland UK ONLY. In some cases a surcharge will apply to the Scottish Highlands, Ireland and other Islands of the UK. For other destinations please call for Rate /POA. ALL Deliveries are made to KERBSIDE ONLY on a non timed basis, unless an “Unpack and Position” or other service, at an additional cost, has been requested(This service requires clear, flat access otherwise the delivery will default to kerbside only). 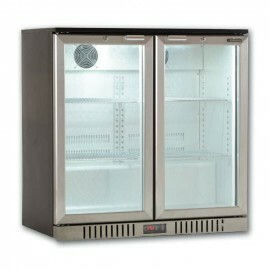 We offer free delivery on all commercial refrigeration & catering equipment orders over £400 + VAT to mainland U.K. A delivery surcharge will also apply to some areas in Northern Scotland, Northern & Southern Ireland,Channel Islands, Isle of Man and Isle of Wight; For deliveries into Europe please call one of our advisors. Most orders are dispatched from stock with a lead time of 1-5 working days. 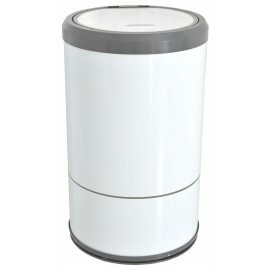 Free Next Day Delivery can be arranged on selected products. For next day delivery, orders must be placed and full payment cleared between 10am and 12pm dependant on manufacturer / Product. We cannot offer next day deliveries for orders placed over the weekend or bank holidays. All next day deliveries are subject to stock. The 65RC is a great promotional chiller that can be branded at the point of manufacture to create ma..
GREAT VALUE single door bottle cooler ideal for any back bar. 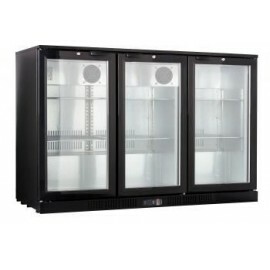 Finished in black the unit features in..
Low cost great value double door bottle cooler ideal for any pub or restaurant back bar. The un.. Triple door undercounter back bar unit ideal for any pic, club or restaurant. With capacity for 272 .. 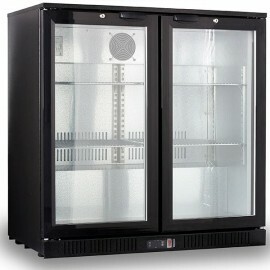 FANTASTIC value single door bottle cooler ideal for any back bar area. 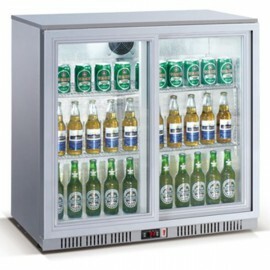 The cabinet boasts automatic ..
Great value double door bottle cooler finished in silver. The cabinet is ideal for any back bar.. 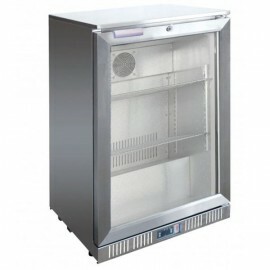 FANTASTIC value double door bottle cooler ideal for any back bar area. 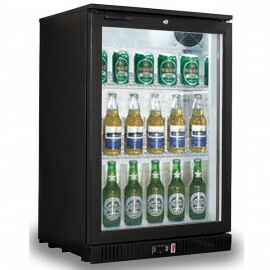 The cabinet boasts automatic ..
LOW COST great value double door bottle cooler ideal for any pub or restaurant back bar. 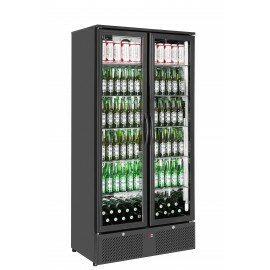 The unit ha..
An impressive full height double door commercial back bar bottle cooler ideal for use in any pub, ba..